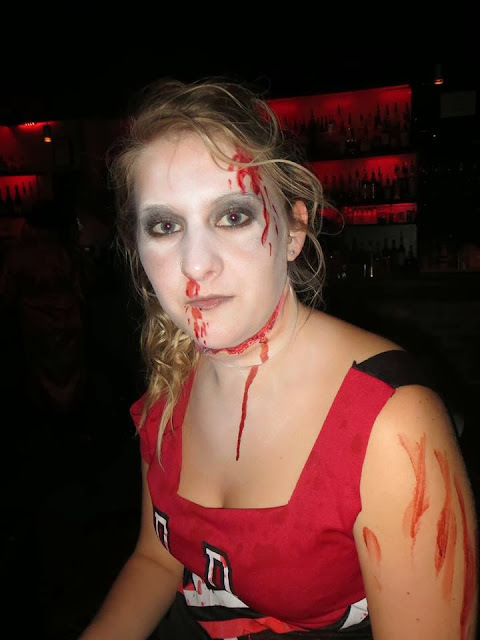 Running for Schnitzel: Halloween Outfit and a Great Party - just a short post! I cannot believe it's been almost a month ago now since that Halloween Party. I have promised to put up pictures and write about my costume. I'll make it quick and short I promise. I went as a Cheerleader Zombie and loved it. I never ever dressed up like that so I was really excited and my friend who helped me with my make up did a really really great job with it. We had a few things which did not go according to plan, but hey that's just how it goes. At the end of the day we had an awesome night! The only thing I must say is, please do not take the fake blood off like I did. I took a make up removal wipe and just wiped my whole face with it. Spreading the red colour all over my face and it made it harder to get it off. So the next day I looked like I burned my face by staying in the sun for too long. UUUUUUps ;-) Next time I know just to wipe that one particular area and then use baby oil, face scrub and finish off with an oil free facial wash. Luckily all was gone by Monday morning. I so can't wait to dress up again soon!